The nineteenth century witnessed a proliferation in the literary uses of dialect, with dialect becoming a key feature in the development of the realist novel, dialect songs being printed by the hundreds in urban centres and dialect poetry becoming a respected form. 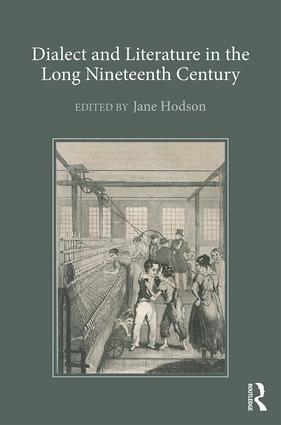 In this collection, scholars from a wide variety of disciplines, including dialectology, literary linguistics, sociolinguistics, literary studies and the history of the English language, have come together to examine the theory, context and ideology of the use of dialect in the nineteenth century. The texts considered range from the Cumberland poetry of Josiah Relph to the novels of Frances Trollope and Elizabeth Gaskell, and from popular Tyneside song to the dialect poetry of Alfred Tennyson. Throughout the volume, the contributors debate whether or not 'authenticity' is a meaningful category, the significance of metalanguage and paratext in the presentation of dialect, the differences between 'literary dialect' and 'dialect literature', the responses of 'insider' versus 'outsider' audiences and whether the representation of dialect is a hegemonic or resistant strategy. This is the first book to focus on practices of dialect representation in literature in the nineteenth century. Taken together, the chapters offer an exciting overview of the challenging work currently being undertaken in this field. Jane Hodson is Senior Lecturer in the School of English at the University of Sheffield, UK.